Did you know that, in addition to providing exceptional dental care, we also offer effective management of facial pain? Whether you have jaw pain, ear pain, headaches or other types of facial pain, Dr. Iwona can address your discomfort using conservative treatment options. After suffering herself from migraines, general dentist Dr. Iwona became motivated to learn more the causes and treatments of facial pain. After completing a mini-residency on TMJ and Orofacial Pain at UCLA, she became a member of the American Academy of Orofacial Pain and annually attends their symposium. She is also a member of the American Pain Association and the International Association for the Study of Pain. Are you a doctor looking to refer a patient to our care? Click here for our online Facial Pain & TMD referral form. If you’ve had imaging such as X-rays or MRIs done elsewhere, please bring those in for Dr. Iwona to review. The process of getting your facial pain evaluated is different from that of a dental exam. Dr. Iwona will perform muscle, cervical and neurological examinations to determine the source of your pain. After the examinations, she can determine if you have a muscle, joint or neurological problem. Treatment for your pain will differ depending upon the diagnosis. It might be in the form of physical therapy, an injection such as Lidocaine or BOTOX® or a referral to a neurosurgeon. Problems with your temporomandibular joint (TMJ) and the muscles in your face that control it are known as temporomandibular disorders (TMD). Dr. Iwona will check the sounds from your TMJ with a stethoscope and establish a tentative diagnosis. How TMJ pain is treated depends on the case but it usually starts with painkillers, a soft diet and exercises for the muscles. Sometimes she prescribes medications such as steroids if inflammation is present. Dr. Iwona also may recommend a splint, which is a specific type of mouthguard that you wear at night. Some patients have clicking joints but no pain and while others do have pain. Dr. Iwona will provide instruction on managing any discomfort with your TMJ through sleeping, posture and exercise. 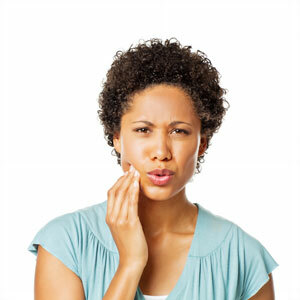 If you’ve had TMJ pain for at least six months, your case could be considered chronic. If your TMJ pain is from a recent trauma, it may resolve in less than six months. She is happy to work with any specialists in the treatment of your facial pain. For various types of facial pain relief, Dr. Iwona sometimes administers Sphenopalatine Ganglion Blocks (SGB). She has some patients who come in with tinnitus who are referred to her by ENT specialists. “One of my patients comes in every 3-4 months for injections for the specific muscle inside the mandible. When I give her Lidocaine or BOTOX injections the ringing in the ear disappears.” Dr. Iwona also can treat trigeminal neuralgia with BOTOX injections. If you’ve been putting up with facial pain, we encourage you to contact our Barrington practice today. Dr. Iwona can provide a diagnosis and treat the problem using various options.